For a small outlay on a few colors and a suitable brush, fabric painting opens up endless opportunities for transforming your wardrobe and your home. 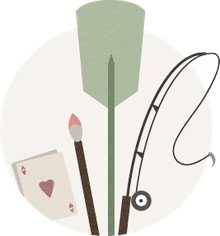 It enables you to create one-of-a-kind pieces of wearable art (t-shirts are the most common) or to design some special cushion covers, curtains, or a wall hanging. Will Anything Less Than 100% Cotton Do? Purists say the best fabric for painting on is 100% cotton with a tight weave (an off-white or cream fabric will dull the paint slightly). But good results can be obtained with rayons and silks too. The best is to try a sample square to check the results. If a fabric is loosely woven, paint tends to seep through the threads before it's dry. This tends to reduce the intensity of the colors. A finely woven fabric is also easier to paint detail on than a loosely woven one. To Prewash or Not to Prewash? The reason for prewashing fabric before painting on it is to remove any sizing added during manufacture which may prevent the paint from adhering to the surface. It also gives it a chance to shrink, if it's going to. To test whether a piece of fabric really needs prewashing, drop a little bit of water on it. If it beads up on the surface, it needs washing. If it sinks in, so should paint. If you do wash a fabric, don't add fabric softener! You're trying to get rid of chemicals, not add new ones. Take the time to iron the fabric well. Wrinkles can create havoc on a design. The easiest way to set fabric paints is to iron it for a few minutes (check the manufacturer's instructions). If you iron on the wrong side of the fabric, the paint will still set fine and you don't have to worry about it rubbing off onto the iron or the colors bleeding into each other. Alternatively, use a press cloth. Allow the paint to dry thoroughly before ironing, at least 24 hours. If you have a large project, you may want to try your tumble dryer to tumble a sample piece on high for half an hour, then wash it to see if your dryer was warm enough. If you're really brave, you can try setting it in your oven. Otherwise, ironing is the way to go. Wetting the fabric with clean water before painting it encourages colors to flow into each other, like in a watercolor. But don't add too much water, as it'll dilute the colors; the fabric should be damp, not soaking. Stamping and stenciling on fabric work best if you're working on a lightly padded surface, an old towel works well. Or if you don't want to sacrifice a towel, cover a sheet of thick card with waxed paper (so it can be wiped clean). 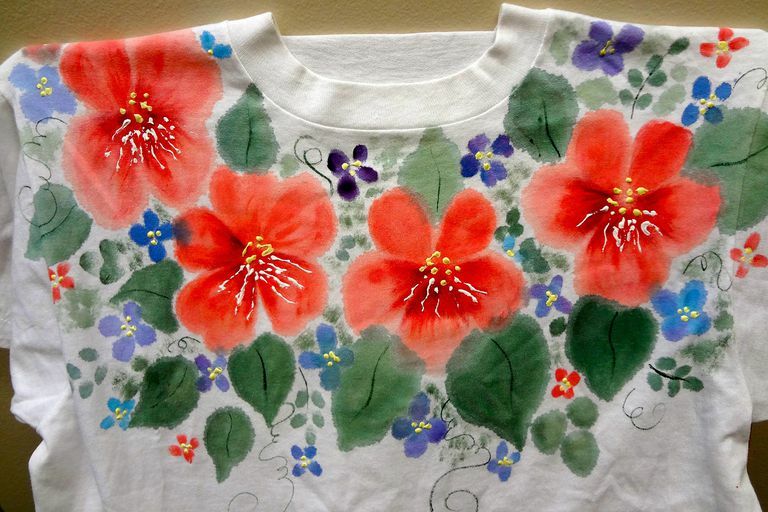 Remember when painting a t-shirt to insert something like a few sheets of newspaper, a bit of card or plastic inside the shirt so the paint doesn't seep through onto the back of the shirt.